Got a spring in your step this morning after the glorious weekend? Us, too! And with summer, comes summer fashion. If you’ve already read every trend report going, but still haven’t settled on what works for you, may we suggest a little cherry print to put you in, well, a cheery mood. It might not have been a big trend on the international catwalks, but that hasn’t stopped the high street indulging, with cherry prints brightening up the window displays at all our favourite stores. Top of the must-buy list has to be Yumi’s cute-as-they-come sundress (above), available to buy now at asos.com; New Look’s cherry-print playsuit comes a close second. 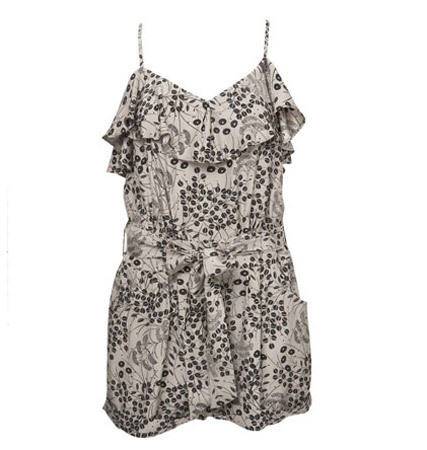 For those who want their prints a little less bright, Warehouse’s sweet playsuit (below) is a more subtle take on the trend, while Dorothy Perkins’ purple print tunic top is perfect for those who don’t usually wear red, but are still in the mood for something sweet. Of course, you don’t have to wear the print from top-to-toe. Topshop is the place to go for sweet cherry-print knickers and cute boy shorts, while asos.com’s cherry-print tights are a great buy-now-wear-later purchase. Finally, with summer holidays just around the corner, we’ve already placed an order for this 50s-style cherry-print bikini. Feeling fruity? We certainly are!